Today, international investment firm Digi-Capital published its in-depth review of the global gaming space, giving us a sense of the size, breadth, and activity of the international gaming market in both a year-end retrospective of 2012 as well as what we can expect from the industry in the coming year. For starters, Digi-Capital found that gaming M&A “beat all records” in 2012, with $4 billion in total M&A for the year, representing an 18 percent increase in the overall transactional value for the year, up from $3.4 billion in 2011. However, there was a 27 percent decrease in transactional volume, so while the total value of M&A saw record highs, it was thanks to a smaller amount of blockbuster deals, as there was a 60 percent increase in the average transaction size (to $49 million). 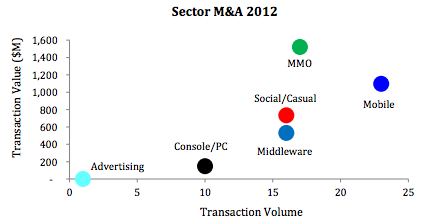 The M&A transaction value led by multiplayer online games at 38 percent, followed by mobile at 27 percent, social and casual games at 18 percent, with middleware, console and advertising trailing behind. In comparison transaction volume was led by mobile at 28 percent, followed by MMO at 20 percent. As for the investment side, there was $835 million in total investments made in the industry over the course of the year, with a 57 percent decline in value from record highs in 2011 at $2 billion. Investment transaction value was led by middleware and gamification at 35 percent, mobile at 31 percent, MMO at 18 percent, followed by social, console and advertising. The $1 billion-plus decline in social game investment made up 94 percent of the decline from 2011, as VCs abandoned social gaming investments, with the exception of social gambling. Furthermore, some firms who had been prior investors in gaming (not just social) exited the market completely after the social games bubble of the prior year burst with a sense of finality, creating what the firm believes to be a disconnect “between fundamental online and mobile games market growth and investment.” In turn, Kickstarter emerged as a complement to traditional VC investing, amounting to about 6 percent of total video games investment at about $49 million, most of which was concentrated in PC games (63 percent) and hardware (23 percent). The investment firm also found that the Asian market represents the greatest source of buyers, with 7 of the 10 largest gaming deals in 2012 made by Chinese, Japanese or South Korean buyers. However, Digi-Capital continues to see a significant knowledge and relationship gap between Asian and Western markets, which could hamper deals going forward. Nonetheless, the report estimates that Asia and Europe could take 87 percent of revenue for online and mobile games by 2015, with China owning the largest potential share at 32 percent. Unsurprisingly, the report also finds that industry dynamics continue to shift at “an unprecedented rate,” with free-to-play games potentially delivering 55 percent of mobile and tablet app revenue and 93 percent of mobile and tablet app downloads by 2016. The basis of competition across gaming market sectors continues to move towards free to play and communal games and business models, with gamification currently attracting a good deal of early-stage investment — although a lot has to happen before the gamification market reaches anywhere near its full potential. Going from there, the report shows that online and mobile games continue to deliver strong growth and returns, with forecasts estimating that this sector could the entire games market to $83 billion and take more than 55 percent revenue share by 2016. 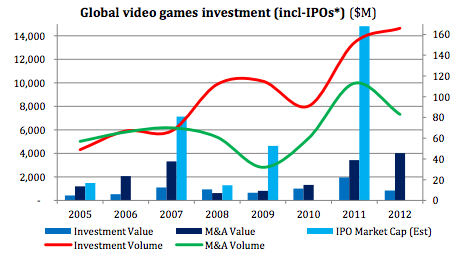 Both the M&A and IPO markets in gaming delivered greater than 6x ROI between 2005 and 2012, the report finds, and although the IPO market itself was somewhat weak last year, it is expected to pick up in 2013 and 2014. 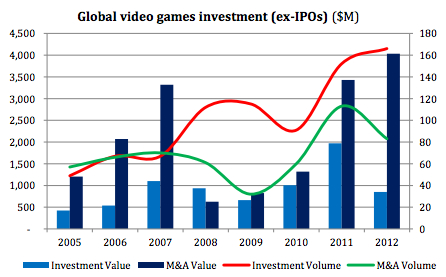 Check out some more great analysis of what to expect in the gaming industry in 2013 from Tadhg Kelly’s recent in-depth look into the market. Find Digi-Capital’s full report here.